Dr. Christa Corbett was born and raised in Rochester, New York and obtained a degree in biology from the University of Pittsburgh in 2001. She received her DVM from the Atlantic Veterinary College in Prince Edward Island, Canada in 2005. Christa then returned to her home state to complete a small animal internship at Long Island Veterinary Specialists (LIVS) where her love of Ophthalmology began. She stayed on for an extra year for a specialty internship in Ophthalmology at LIVS. From there she headed to the Midwest to pursue a residency in Veterinary Ophthalmology, and a Master of Science in Veterinary Clinical Sciences at The Ohio State University, both degrees were awarded in 2010. Christa began her career as a board certified ophthalmologist in a multi-specialty private practice in Columbus, Ohio. 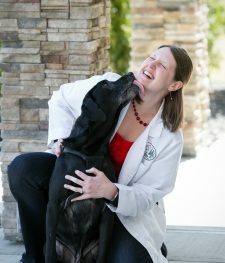 She is a Diplomate of American College of Veterinary Ophthalmologists. Christa’s love for ophthalmology arises from her desire to problem-solve cases from both a medical and surgical standpoint. The most rewarding part of her job is giving back the gift of vision to her patients. One of her favorite procedures is cataract surgery, because patients walk in the door blind and walk out with the ability to see things they haven’t seen in quite some time. Christa is interested in all areas of Veterinary Ophthalmology, but she does have a special interest in mammalian exotic pets and eyelid reconstructive surgeries. She has participated in research for monitoring of glaucoma patients, surgical treatment of glaucoma and novel eyelid reconstructive procedures. After six years in the Midwest, Christa was very excited to move back East in 2013 and to join Upstate Veterinary Specialties. The Northeast is where she belongs, and she is extremely happy being closer to family. In her free time Christa enjoys spending time with her husband Max, her Labradors “Gus” and “Frankie”, and her cat “Optimus Prime”. She enjoys skiing, hiking, and doing anything crafty.